Le Parfum by Elie Saab is an oriental floral fragrance for women. Elie Saab comes from a Mediterranean city, a place bathed in heat and light and surrounded by vibrant delicious scents from the nature. One of Elie’s most prominent memories from home is the smell of orange blossom; when the wind blew through the orange trees close to his childhood home, Elie would be surrounded by the earthy scent of orange blossom and so his first fragrance is an ode to this lovely note. Le Parfum is a very feminine, soft, pretty and bright perfume with dominating notes of jasmine and orange blossom. The honey is there to give the florals a subtle sweetness while the patchouli, roses, and woody notes ensure you get a rounded, well blended fragrance. Le Parfum EDP was launched in 2011 followed by the Eau de Toiette in 2012. The EDT is a lighter version, with less honey. It is softer and more floral. This is such a wonderful perfume and I cant just get enough of it. I would highly recommend buying from Perfume-click.... the service and price both make it a 5/5 score. Fantastic gift set made the perfect present, amazing scent that lasts for hours and the shower gel and body cream are lovely too. Amazing seller as always. 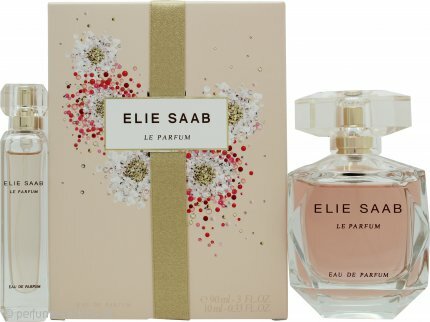 Elie Saab Le Parfum Gift Set 3 x 20ml EDTBest price i have ever found! This is my favourite perfume but usually very expensive, I couldn't believe the price at Perfume-click.co.uk, hence the reason I came back to the site to order some more perfume. I smelled this perfume on one of my customers and she told me whet it was. I was looking for a fresh new daytime scent and I love this. It isn't too heavy and is lovely and floral and soft. I love this perfume and am always complimented on it. Buying this was an easy process start to finish. Fast service with the bonus of a handbag size bottle. Beautifully presented in a beautiful box, lovely fresh scent I am so happy with this purchase and will defiantly buy again.